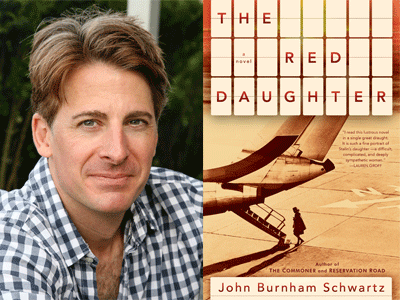 John Burnham Schwartz--bestselling author of Reservation Road--discusses his enchanting new novel, The Red Daughter. John will be in conversation with Abraham Verghese, author of Cutting for Stone. About The Red Daughter: Running from her father's brutal legacy, Joseph Stalin's daughter defects to the United States during the turbulence of the 1960s. For fans of We Were the Lucky Ones and A Gentleman in Moscow, this sweeping historical novel and unexpected love story is inspired by the remarkable life of Svetlana Alliluyeva. She is a contradictory celebrity: charismatic and headstrong, lonely and haunted, excited and alienated by her adopted country's radically different society. Persuading herself that all she yearns for is a simple American life, she attempts to settle into a suburban existence in Princeton, New Jersey. But one day an invitation from the widow of the architect Frank Lloyd Wright arrives, and Svetlana impulsively joins her cultlike community at Taliesin West. When this dream ends in disillusionment, Svetlana reaches out to Peter, the one person who understands how the chains of her past still hold her prisoner. Their relationship changes and deepens, moving from America to England to the Soviet Union and back again, unfolding under the eyes of her CIA minders, and Svetlana's and Peter's private lives are no longer their own. Novelist John Burnham Schwartz's father was in fact the young lawyer who escorted Svetlana Alliluyeva to the United States. Drawing upon private papers and years of extensive research, Schwartz imaginatively re-creates the story of an extraordinary, troubled woman's search for a new life and a place to belong, in the powerful, evocative prose that has made him an acclaimed author of literary and historical fiction.